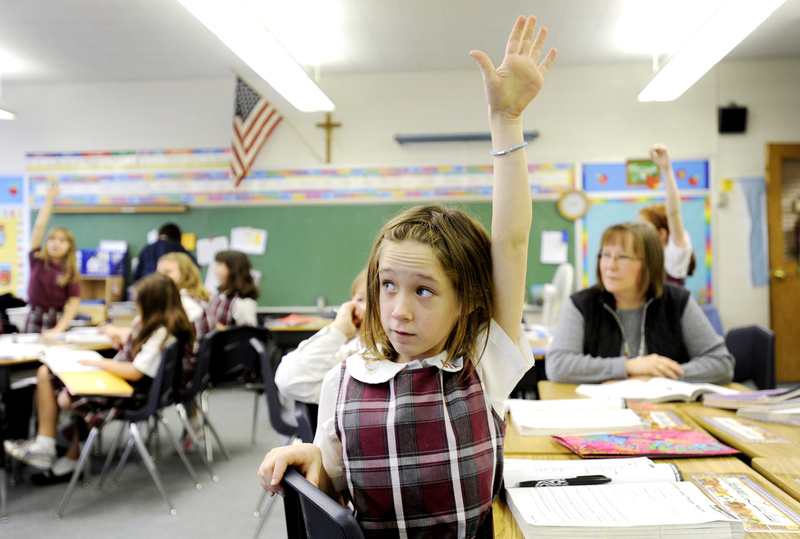 A fourth-grader raises her hand to answer a question at Christ the King School in Irondequoit, N.Y., in this 2011 photo. Even with school out for the summer, the debate is ongoing about the love-them-or-hate-them Common Core State Standards, developed by the National Governors Association and the Council of Chief State School Officers. (CNS photo/Mike Crupi, Catholic Courier) (July 18, 2014) See WASHINGTON LETTER July 18, 2014. NUEVA YORK.- La Oficina del Superintendente de Escuelas del la Arquidiócesis de Nueva York anunció hoy que siete escuelas católicas en toda la Arquidiócesis de Nueva York cesarán sus operaciones a fines del año académico 2018-19.